Palestinians of East Jerusalem, Jordan and Israel are again able to travel to Saudi Arabia to perform the Umrah pilgrimage after nearly five months of visa restrictions that barred almost three million Palestinians from entering the country, Middle East Eye can reveal. Negotiations with the Saudi embassy in Amman to backtrack its policy were "long and exhaustive," according to the director of a travel agency in East Jerusalem focusing mainly on religious pilgrimages, who has inside knowledge of the talks and wished to remain anonymous. "Around 250 pilgrims travelled through my company to Mecca this month and returned to Jerusalem this week. It took several months to issue them visas, and our work was stalled," the director said. The Umrah pilgrimage can be taken at any time of the year, in contrast to the date-specific Hajj. MEE reported in September that Saudi Arabia had introduced a new policy refusing to issue visas for Palestinians holding temporary Jordanian passports. The measure directly affected almost 800,000 Palestinians living in Jordan - 634,000 Palestinian refugees whose families were displaced in 1948 and 1967, and another 150,000 Palestinians from Gaza - as well as 460,000 Palestinians living in Israeli-occupied East Jerusalem. In October, a Saudi official at the country's embassy in Beirut confirmed to MEE that visa restrictions would also include Palestinian refugees in Lebanon, estimated to number 174,422, according to the country's first and only census of the community in December 2017. By November, more than 1.5 million Palestinian citizens of Israel were banned by Saudi Arabia from travelling on temporary Jordanian passports. Palestinian citizens of Israel had already endured three decades without being able to perform the Hajj or Umrah, a situation that ended when Jordan's King Hussein began in 1978 a policy, in coordination with the Arab League, to issue travel documents for them to perform the Hajj, one of Islam's five pillars. Saudi Arabia and a majority of Arab states do not recognise the Israeli passport. The temporary Jordanian passport was a tool to facilitate the Hajj and Umrah pilgrimages to Mecca for Palestinian citizens of Israel who hold an Israeli passport. The Saudi move last year affected 2.94 million Palestinians in total who had no access to any other form of travel document allowing them to go to Saudi Arabia. The temporary Jordanian passport is a document issued to Palestinians by the Civil Status and Passports Department in Amman. 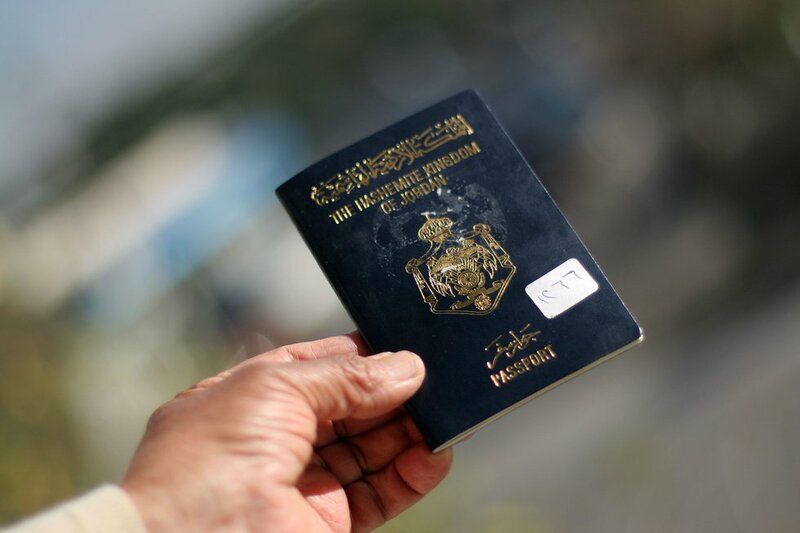 Palestinians were initially encouraged to obtain passports issued by the Ramallah-based Palestinian Authority (PA) or apply for full Jordanian citizenship in order to get the Umrah visa. Some Jordanian politicians and diplomats told MEE that they feared the move by Saudi Arabia was a means to pressure Jordan to naturalise Palestinian refugees and spell an end to "Palestinian identity and the right of return for refugees". But in December, an understanding was reached with the Saudi embassy in Amman to keep the status quo of issuing Umrah pilgrimage visas on temporary documents held by Palestinians. "Despite this, they refused to issue visas in January, saying that each applicant had to send their Israeli ID cards to Amman," the head of the travel agency in East Jerusalem said. "You can't move in Jerusalem without carrying your ID card, otherwise you risk being questioned by Israeli police or soldiers, and maybe detained. Plus, there is a risk that ID cards could get lost in the visa process, and this scared people from including it in the applications." Israel occupied East Jerusalem in the 1967 Middle East war, and has since attempted to annex it in a move never recognised by the international community. Palestinians who remained in the city and their descendants are under Israeli law recognised as East Jerusalem residents. But this status is often revoked by Israel for a myriad of reasons - such as dual nationality and failing to prove that they live in Jerusalem. "We had to reach a compromise and we asked the top Islamic court in Jerusalem to invent a new document called a Proof of Address. You pay 77 Shekels ($21) to issue the document, and you need two witnesses. Eventually, the Saudi embassy accepted this document instead of the ID," he said. The source said that there was no official help from the PA.
“We had discussions with other heads of Hajj and Umrah agencies in Palestine and with judges in Jerusalem to come-up with the Proof of Address as a solution, and it worked,” he said. For now, Palestinians inside Israel, East Jerusalem and Jordan can undertake their pilgrimage to Umrah after waiting for almost half a year, a Jordanian tourism official confirmed to MEE. MEE could not confirm if the 174,000 Palestinian refugees in Lebanon were included in the new procedure. “We wish that the visa status quo stays as it is now," the travel agency director told MEE.